Whether you choose to control this vehicle with your mind or a joystick, the camera mounted on it will give you a new view of the world. 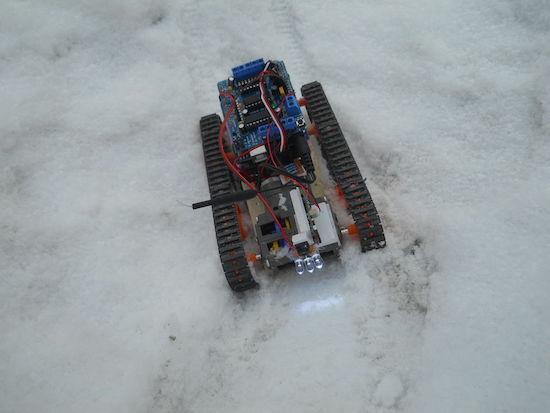 Maker “Imetomi” was inspired to create a tracked robot after he was able to salvage a camera off of a cheap drone. 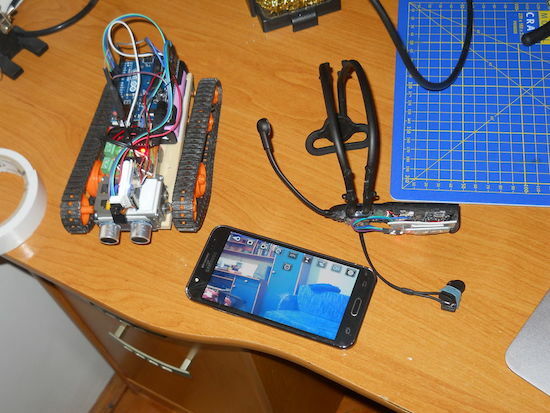 This became the basis of his FPV setup, which he fitted onto a little tracked vehicle. Although this would have been enough for most people, in addition to building a joystick-based controller, he also made it work with a brainwave headset. Imetomi now has something that he can drive around virtually, spying on passersby, as long as it stays within the VR transmitter’s 50-meter range. Be sure to check out the video below, where the small bot shows of its impressive all-terrain capabilities, and read his Instructables write-up here. Nice project! Where did you get the neurological headset? I would really appreciate it if you could direct to a tutorial on how to build a headset like this, preferably one that can decode signal in the primary motor cortex.